After the long Minnesota winter, there’s nothing better than sitting out on your backyard patio or deck and drinking in the summer sun. But just like its winters, Minnesota’s summers can be pretty intense — with high temps and humid, sticky air making our outdoor adventures a little uncomfortable at times. The good news is that there are a few things you can do to keep your patio or deck cool and enjoyable this summer. Below we offer five easy and affordable ideas. This one may seem a little obvious, but it’s important to mention because there are so many options that you can choose from. It’s also one of the easiest ways to protect yourself from the blazing summer sun. Options include pergolas, gazebos, screen houses, umbrellas and awnings — all of which can provide a space to escape when the sun becomes a little too intense. If you’re looking for the most affordable solution, your best bet is likely an umbrella. They can be part of a table set or be free-standing. If you’re OK with a more expensive option — and want to add a little style — consider a pergola or gazebo. 2. Use standard fans or install a ceiling fan. Fans circulate the air, which is an excellent way to provide a nice breeze as you enjoy the outdoors. Utilize a standard fan by plugging it into an outdoor outlets, or install a ceiling fan if you have a covered patio or deck. 3. Try a misting fan. Misting fans are just like regular fans, but rather than just blowing air, they blow a fine mist of water that cools the surrounding area. Misting fans come in a variety of styles, with some requiring a direct connection to a water source and others using a built-in water reservoir. They’re available at a variety of online and brick-and-mortar retailers such as Home Depot and Walmart. If you have a concrete patio, consider painting it a light color. Bare concrete typically gets hotter than painted concrete, so painting it a light color (such as white or egg white) can help keep the surface a little cooler. DIY.com has a step-by-step guide for painting a concrete patio yourself. 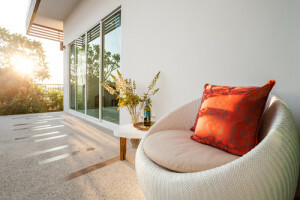 If you like to take to the outdoors barefoot, adding a rug to your patio can be an excellent way to provide your feet with a cooler walking surface. Rugs can also add a touch of style. If you do decide to add a rug, make sure you get something that is designed to be used outdoors. Rugs are made from a variety of different materials, and outdoor rugs use materials that are able to survive nature’s elements. Overstock.com offers more insight on outdoor rugs. We hope you found these tips useful, and that your summer is filled with fun, friends, family and lots of sunny days. Of course, if you find yourself in need of air conditioning repair or maintenance this summer, get in touch with us. We’re here for you.